Guest blogger: Professor Harold C. Connolly Jr. 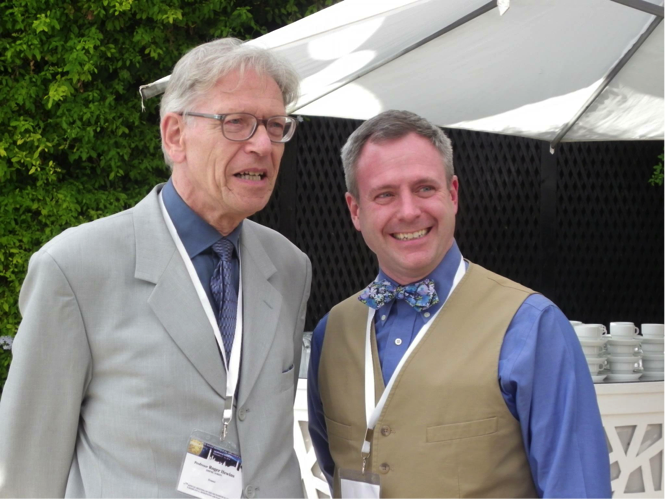 The 77th Annual Meeting of the Meteoritical Society was held in Casablanca this year. 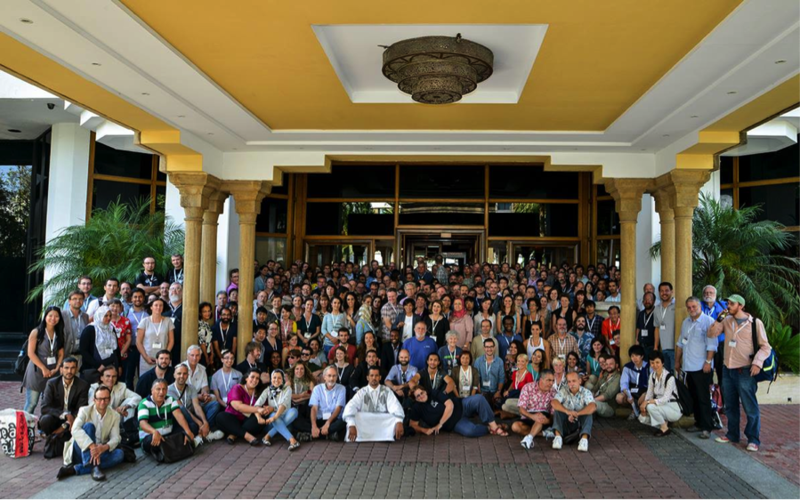 In the second week of September 2014, approximately 450 scientists from around the world gathered in Casablanca, Morocco to give professional talks and discuss all things meteorite—this was the 77th annual meeting of the international Meteoritical Society. The meeting is the major yearly gathering for scientists whose research is concerned with deciphering and interpreting the story that rocks, in this case meteorites, tell us about the formation of the solar system. Astronomers look to protoplanetary disks to understand the astrophysical environments where planets form. The fields of geology and cosmochemistry unravel the story of planet formation in our solar system that complements the information astronomy can provide. The oldest witnesses to the formation of the Earth-like planets are chondritic meteorites and the parent bodies or asteroids from which they originated. My name is Professor Harold C. Connolly Jr. I am a professor of Earth and Planetary Sciences at the City University of New York, Research Associate at the American Museum of Natural History, and most importantly for this blog, Mission Sample Scientist for the OSIRIS-REx mission. Mission Sample Science (MSS) is concerned with several important areas of science that the mission encompasses, but the major focus is on the analysis of regolith material that we be returned from Bennu to understand the origins and evolution of Bennu. The meeting in Casablanca (Casa as the French call it) was truly exciting to me for several reasons. I gave the Leonard medal (the highest honor given the Meteoritical Society to one of its members for outstanding contributions to the field of Meteoriitics) citation for Professor Roger H. Hewins, my former professor-mentor. There can be no greater honor in the life of a student then to present their former mentor to a society for its highest award. Harold Connolly (right) and Professor Hewins (left) after the presentation of the Leonard Medal in Casablanca. Next, Professor Lauretta and I were elected Fellows of the Meteoritical Society and it was my honor to receive the award in person for myself and accept it on behalf of Professor Lauretta, whose duties with the OSIRIS-REx mission made it so that he could not attend in person. It is a wonderful honor to be recognized by ones peers for your contributions to the field and be made a Fellow. Only 1% of the Meteoritical Society’s membership can be elected as a Fellow in any odd-numbered year. 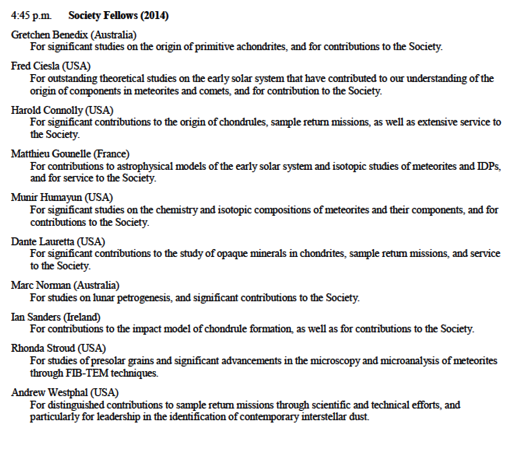 The Fellows elected this year to the Meteoritical Society and the citation for their election. The science presented at the meeting was very exciting and I was very pleased to be able to present an abstract based on our new paper that we have submitted in Earth, Planets, and Space (Connolly et al., 2014). The science behind our paper is a direct result of ongoing research within the OSIRIS-REx mission, which actively produces research throughout the duration of the mission. We were also honored to have a collaborator on the abstract and paper from outside the OSIRIS-REx mission, Professor Shogo Tachibana, who is a professor at Hokkaido University in Sapporo, Japan and essentially my counter part on the Hayabusa 2 space mission. This mission will also go to a carbonaceous-rich asteroid like OSIRIS-REx and is a JAXA endeavor (the Japanese Space agency). As Mission Sample Scientist, it is of major importance to me and the mission that we maintain an active role in the meteorite science community and learn what is cutting-edge science and assess how new results might provide insight to asteroid Bennu. Finally, science cannot be done in isolation. It must be accompanied by interaction with colleagues and the best kind of interaction is face-to-face. It is important to be able to talk at great length about science with colleagues and this requires that we meet at meetings and, in some case, internationally. Although the members of the OSIRIS-REx team who attended the meeting did so through funding from sources other than the Mission, we, of course, had a chance to discuss issues related to the Mission. Most importantly we were able to interact with colleagues who were not aware of various aspects of the Mission and thus educate them on science goals of the Mission and how we will meet those goals.